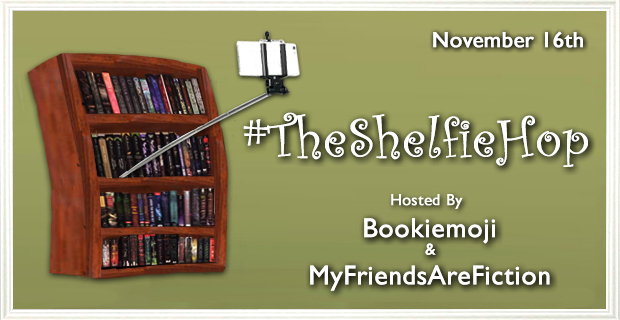 I'm super excited to participate in this fun hop hosted by Crystal @ Bookiemoji and Kristen @ My Friends Are Fiction. 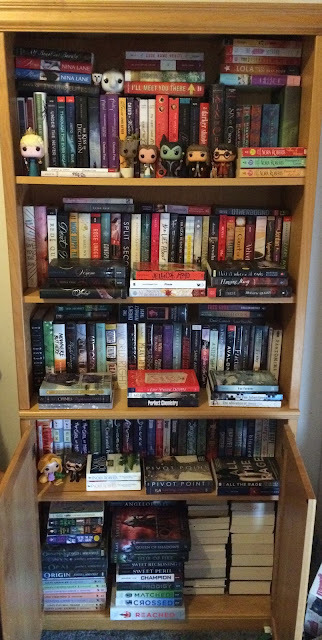 It's all about sharing pictures of our bookshelves, and it gave me amazing motivation to do a major cleanup and re-organize my one lone wolf. And I have to say, I'm pretty proud of it. The 2nd shelf contains unread books that I MUST READ ASAP. Like, I want to read all of them at the same time and I wish I could. Many are ones I’d been excited about before they were even published, and then I never had the chance to read them. Some complete series, and then there are a few ARCs that I would like to get to before their 2016 release dates. The 3rd shelf contains MORE unread books, but these are ones that I’m not rushing off to read just yet. I would like to get to all of them at SOME point in the near future, but they aren’t a priority. The 4th shelf are books I read and loved/enjoyed immensely. They aren’t all-time favorites, but I adore having them on display here (though some are only on here because they didn’t fit on the top, I’m just saying. There are quite a few that were amazing enough to go up there). And the bottom, the 5th “shelf,” contains ALL THE SERIES. No, but seriously, it is stacked in so tightly, double-edged, because I have so many that I’ve started/haven’t started/don’t own all of them yet so I can’t start them, and I needed all of that space for them. 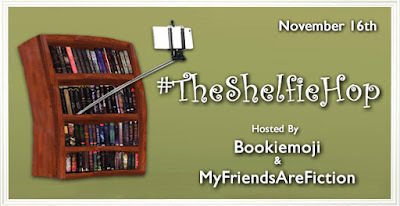 Here are the participating blogs, so be sure to stop by everyone's posts and check out their shelves! Girl, you need another shelf! But I love how you make it work! Totally looks great. Also, super impressed with your shelf you made! Alas, I, too, only own one bookshelf. It's incredibly sad. Yours is super nice though! And I envy your ability to double load the books (for lack of better phrase, like, being able to have two stacks on one shelf). I love how you have a whole shelf of books you MUST READ, haha. You do need to read More Happy Than Not. I'm surprised you haven't devoured The Lies About Truth. YOU MADE YOUR OWN BOOKSHELF, GOLD STAR FOR YOU. Look at your skills! Are you going to make me one? I want one. I love floating shelves. Nice shelves! I'm impressed that you made your own bookshelf. All I got to make in shop class is a car. (And I tried to cut my thumb off..) There's never enough space for books and bookshelves. There's nothing wrong with a jar of sand! I have rocks on mine. You definitely make the most of your bookshelf! Love it! I love that you have a shelf dedicated to the Must Read Now titles. :) I have a list like that, but not a shelf. So glad you shared! YOU MADE THAT SHELF! wow! That's awesome. And the coolest part? It holds books. You def need to get more bookcases so you can fill them all with the pretties. I love your collection. So lovely. I SPY JELLICOE ROAD. I highllllly recommend you read it ASAP. It'll throw you in the ringer and spit you back out full of emotions. YOU HAVE A BIGGER BOOKSHELF THAN I DO. SO THERE. OK? Hahahha. man it doesn't even matter that you don't have a lot of bookshelves because YOU MADE ONE. That is INCREDIBLE. You are so talented! Whenever I had to do the woodworking portion of class, I would ask my friend to do it for me haha! I cannot believe you only have one bookshelf. I'm amazed it holds the weight.. Mine would take one look at that pile and collapse on me. Great collection. Oh, look at ALL YOUR PRETTY BOOKS!!! And looking at your TBR shelves...you need to get on some of those ASAP. And I'm so jealous you got to make a bookshelf in year 7...I only got to make a pencil box...well, attempted to make a pencil box is probably more accurate. I would have tried harder if it had been a bookshelf.